When it comes to your family’s adventurous lifestyle, it’s essential to have a vehicle that’s armed with all the essentials required for a spontaneous road trip near Marlton, Mount Laurel, and Cherry Hill. Fortunately, the 2018 Honda Pilot EX-L arrives decked out in cabin amenities, intelligent safety, and all the technologies your loved ones need to enjoy the journey from start to finish. With those tempting features, it’s no surprise that you’re eager to get a closer look at the details of this potent road warrior. That’s why we’re here with this 2018 Honda Pilot EX-L Review created by Burns Honda. Once you’ve had a chance to scope out the specs, you’ll be ready to face your next adventure behind the wheel. On those particularly chilly mornings, you need a way to keep everyone inside your vehicle as warm and toasty as possible. And, inside the stylish cabin of the 2018 Honda Pilot EX-L, you’ll face your journeys with a leather-trimmed interior and heated front seats. In addition, the standard one-touch second row seats help your kids and other passengers easily access the third row. That way, they won’t need to climb around the cabin to secure their favorite seat inside your vehicle. Looking for a way to effortlessly access the cargo compartment inside your Honda Pilot EX-L? If so, all you have to do is press the button of the Power Tailgate. From there, the trunk door will automatically open, so that you won’t need to set down your grocery bags to load up the storage area. Your family should always be surrounded by the safety solutions that’ll keep them out of harm’s way. Well, that’s exactly what you’ll find in the 2018 Honda Pilot EX-L with its optional suite of driver-assistive technologies, known as Honda Sensing®. Once you’ve been warned about the possibility of a collision, you’ll be able to take the necessary corrective actions to avoid an accident. The result? A more confident drive. 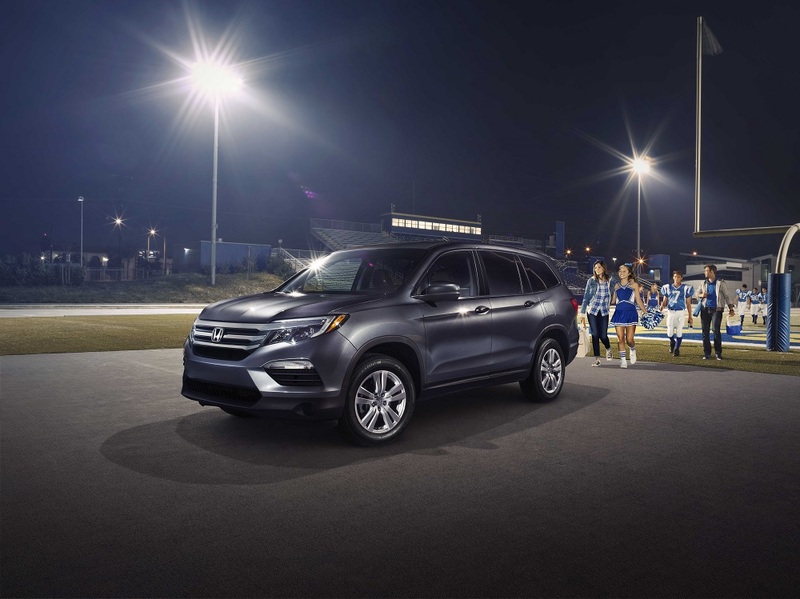 Keeping your family in bright spirits during those lengthy road trips just got easier thanks to the well-equipped cabin of the 2018 Honda Pilot EX-L.
With available technologies like the Rear Entertainment System, your little ones can soak up all the action of their favorite films on a 9-inch screen situated in front of the second-row seats. Plus, the second-row sunshades keep the cabin dark for an optimal viewing environment. To tune into your own library of music and applications, simply press the responsive touchscreen and choose your song. Then, get ready to unwind to the sound of your most beloved music genre. Test Drive Your 2018 Honda Pilot EX-L Today! A busy schedule of soccer games, school pickups, and work commutes requires the assistance of a dependable sidekick. And, with the 2018 Honda Pilot EX-L as your companion on the roads of Marlton, Mount Laurel, and Cherry Hill, nothing will prevent you from keeping your family in pace with the day’s demands. To get a closer look at everything this dynamic SUV has to offer, feel free to stop by the showroom at Burns Honda or schedule your test drive today!